FRANKSTON Dolphins have taken a major step towards funding new broadcast quality lights at their Frankston Park ground, with the federal Liberal party this week announcing an $850,000 contribution to the cause. The money will be put towards the new lighting structures, which could see the ground host night matches to be broadcast on television. Member for Dunkley Chris Crewther visited Frankston Park on 26 August to announce the funding. “Broadcast quality lighting is vital for the future growth of professional footy in the Frankston area and will help to showcase our region on the national stage. This investment will give our local footballers a clearer pathway to elite opportunities and will also help to attract AFL and AFLW games to the Mornington Peninsula,” Mr Crewther said. At total of 2.35 million has now been committed to the project, with Frankston Council also chipping in $850,000 in addition to the state Labor government’s $650,000 contribution. The project is expected to cost $2.5 million, but Frankston Dolphins president Peter Geddes is hopeful of raising the remaining funds. “We are in discussion with our current and extended stakeholder bodies regarding project contingency funding of up to $150,000 and are confident that we can also secure that funding if required,” he said. Mr Geddes said that the new lighting was a crucial key to improving Frankston Park. “These lights are really needed. We’re looking to establish what we call a tier two facility, second to the major stadiums. We want to showcase VFL, VFLW, AFLW, and also local Mornignton Peninsula games,” he said. Works are expected to commence before the end of the year with the hope of being finished in time for the beginning of the 2019 VFL season. Discussions have been held to host AFLW and AFL preseason matches. 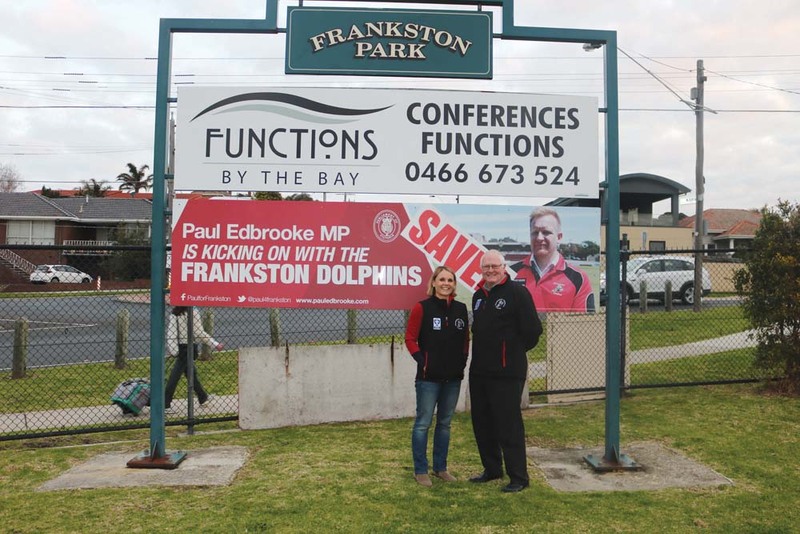 The Labor candidate for the seat of Dunkley Peta Murphy visited Frankston Park, now named ‘SkyBus Stadium’ after a sponsorship deal, and announced a $1 million contribution to the project if Labor were elected at the next federal election. The commitment for funding from the federal Liberal party came four days after this announcement.